Ah, youth. Adolescence and vitality come and go so fast. One minute you are in school, the next minute you’re paying your bills. All you can do is look back to your past and think about the good and bad times you have during high school. Japan loves thinking about high school especially. You don’t have to look hard to find any anime with a high school setting. Even eroge loves high schools, but of course their characters are above 18. It’s a cliched setting that people love going back into because there’s so much to explore about adolescence and it foreshadows the bitterness of adult life to come. High school is a microcosm of adult society as well. Teachers are the authority figures you learn to respect, your classmates are your colleagues, and you form connections in clubs the same way you would have to do in the future. This versatile setting is why it’s still explored even in contemporary Japanese literature. It is a troubling age to be in when you are forming relationships with friends and loved ones. You are allowed to experiment and be silly, but you are also being treated as an adult. Quite the contradiction, but that’s adolescence. High school life is the tunnel children take to become adults. It is an important function in society because it helps people prepare for what lies ahead. It is where we are encouraged to learn about everything there is to know in the world. And it has also failed what it has set to do. That’s why everyone is still writing about high schools now. And it is also why a 2003 light novel series set in a middle school is so relevant to today. 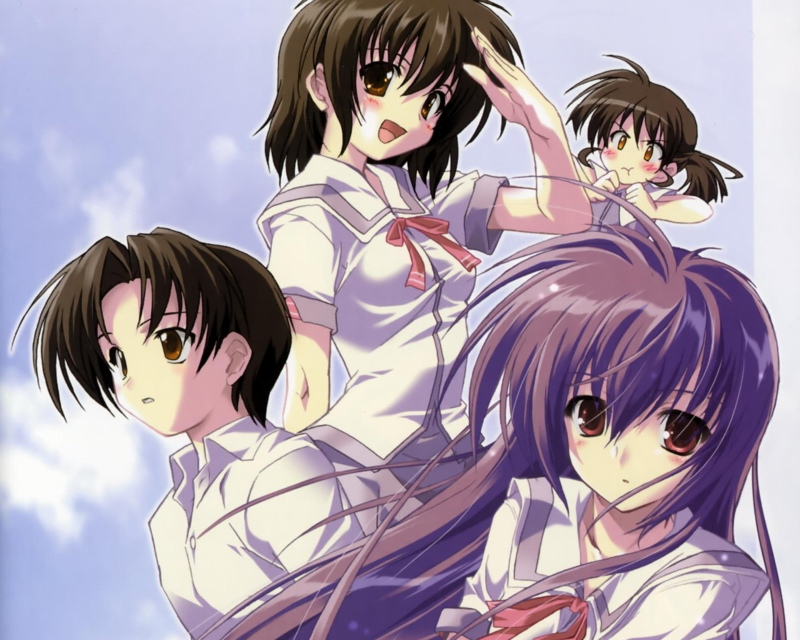 On the last summer night to hunt UFOs, Asaba Naoyuki stumbles upon a mysterious purple-haired girl named Iriya Kana swimming in his middle school’s swimming pool. But as they begin to introduce themselves, a man named Enomoto calls himself Iriya’s brother pushes the girl into a car and drives off. And then, Iriya transfers to Asaba’s school as a new student and the hijinks begin. If this sounds like a 90s/early 00s high school anime in the making, that’s because it is. Throughout the first three volumes, cliches and done-to-the-death plots surface in the writing. The scenarios Asaba and Iriya get into feel like 90s anime. This is why you get to read a sequence of scenes that begin with Asaba’s little sister stalking him and Iriya out of jealousy and end with a scooter chase scene throughout the town. It is the most high school anime book there is — except it’s set in middle school. And the silliness doesn’t stop there. Each page has the whiff of adolescence. Akiyama’s writing is surprisingly dense when he depicts the mundanely fun situations like Iriya challenging Sudou Akiho in a food eating duel. His third-person narration guides the reader through descriptions and point of views as he makes the eating scene more intense and hilarious to read. In fact, you get to see scenes in the eyes of almost all of the characters. The middle school world is filled with little details provided by the unique narrative voices from the participating characters. Everyone has something to say about one another and the world they’re in. The worldbuilding is multicolored and feels so complete. It is probably why even in a storm of cliches everything feels so fresh. There is little to complain when everything is so ridiculous and beautiful through Akiyama’s writing. And when the narration takes a step back to let the readers survey the world, it does so with grace. After Asaba’s parents have seen a play by his little sister in the cultural festival, they let out a gasp and say, “Ah, youth…” There are only a few voices left unheard. We seem to know everything and are confident in our own knowledge of the world. It is this omniscient feeling we have as readers that make us flip the pages for more and more. After all, knowledge is power. But what about those voices we never get to read in? This is where the mystery begins and where the cracks in communication — and adolescence in school — start to appear. We never hear what Iriya feels in any situation. We know that she is a pilot who has transferred to the school because she likes Asaba. That’s about it. Her acts remain mysterious, confusing, and even exasperating when we reach the fourth volume. Likewise, we never get into the heads of Enomoto or Suisenji Kunihiro, Aoba’s most trusted friend. They remain unknown to the readers. Mysteries still exist in the work that fans talk about. We may never know how things actually play out in the series just because of these small little details that are never explained. That little gap of knowledge is crucial to イリヤの空、UFOの夏. Asaba and Iriya don’t know everything and yet, they have to “graduate” from middle school knowing everything about there is to life. Even in a world riffed with well-worn tropes, Asaba and Iriya are still being toyed by the people — the adults — who know better than they do. In the fourth and final volume, the secrets of the setting they’re in punish them for trying to retaliate. They are treated as adults in the real world, despite the fact knowledge is being withheld from them. All they can do is dream about a delusion that they might somehow reach. The characters realize there is no medium — no fake setting like “middle schools” between them and the world. The illusion of society as a buffer zone has been broken. It’s just the two of them against everyone. They have to fend for themselves with no help whatsoever. So how they settle the differences and resolve their own conflicts is heartbreaking and inevitable. And it’s done in a matter-of-fact tone that no reader has any choice but to agree. This is the other side of adolescence we don’t like to talk about: the loss of innocence. Innocence presumes that we can know everything in the world. Shattering that means we allow ourselves to invite uncertainty and even chaos into our lives. But that’s how we grow up too. The real world isn’t what it’s hyped up to be during school. When the adults attend plays done by their children and gasp about how fun it must be to be young, they are reminiscing about this illusion. They remember how they are living in it and, in a blink of an eye, youth has disappeared like magic. Adults have to be aware of the unknowable secrets out there to ruin their lives. It’s the only way to survive in this world. Nobody tells you that in school. So we all feel this jerk in our psyche from writing essays on the themes of Catcher in the Rye in English class to being a salesman in a small company. And we ask ourselves where in the world did the time go to? We had all the time and knowledge in the world, but now it’s all gone. What did we even do during high school? Was middle school even real? And what have we done to deserve this life? That’s why イリヤの空 reflects adolescence so well. It doesn’t shy away in shocking the reader the same way life hits us. イリヤの空 is a representative work of how we go through life by revealing its cliched setting is actually quite not cliched. We can’t ever forget the time when reality started sinking in after high school or college. The party’s over, the tables are set, and we should get rolling. But to where? Knowing all the cliches won’t help us because there’s always something lurking in the background. Wherever we are forced to go, we can only be disappointed in ourselves with our decisions. It is inevitable. So we get jealous of children who have a brighter future than we do. They can probably do better than we do. The reality is they probably will face the same fate as everyone else. Is Iriya the kind of thing you can only appreciate if you look back fondly upon your childhood? I hated Iriya when I read it, but maybe that’s because I want to toss every memory of school I have into a garbage fire. I, uh, have a garbage childhood. For the most part, school is fucked up for me thanks to how restrictive Singapore is. I still feel traumatized by the six years of elementary education in the country. Those are memories I am happy to throw away into the garbage bin. I appreciate Iriya because it emulates the shock between youth and adulthood quite well and the writing is superb. It’s basically the ultimate セカイ系 work since it’s commenting on Evangelion and everything else of that time. If you recall Episode 26, Shinji imagines a separate world where everyone is in school and can live happily ever after. That’s the sort of world Iriya is in. And if you look at it this way, there aren’t any happy endings you can pick in the Human Instrumentality Project. I honestly believe the book will be even more likable if you have a garbage childhood because it actually takes a dump on the myths and ideals of adolescence. Anyway, I think anyone can like Iriya. It’s a classic because many people can read it and still find it relevant. A really cool landmark of Japanese science fiction that should be translated. I consider it the missing link between Evangelion and 00s anime that Westerners definitely need. I guess it’s time to buy Iriya and place against my wall and stare at for a year. I feel there is an emphasis about “middle school instead of high school”, is it what you intended? Yeah, the fact it’s middle school raises the stakes IMO.